In continuation of the artillery and aerial bombardments of Boko Haram enclaves in the Lake Chad region by troops of Operation Lafiya Dole backed by air strikes, Nigerian troops have continued to decimate the dens and hideouts of the terrorists. Towards this end, the military’s evaluation report of the ongoing operation has shown that a major factional leader of the terrorists group, ‘Mamman Nur’ has been fatally injured in the bombardment as he and his sub commanders fled from the onslaught. 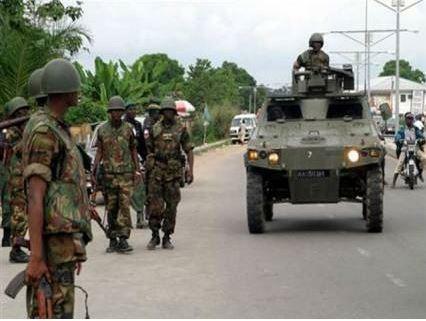 A statement by Colonel Onyeama Nwachukwu, Deputy Director, Army Public Relations, noted that “Several of his foot soldiers have also been killed by troops, while many of the insurgents who escaped are now surrendering to Republic of Niger Defence Forces. “This followed the Amnesty granted the insurgents by the Government of Niger Republic. Recall that Theatre Commander of Operation Lafiya Dole, Major General Rogers Nicholas on Thursday disclosed that over 2, 000 people were rescued while over 200 Boko Haram insurgents have so far surrendered during the coordinated ground and aerial operations in the Lake Chad Region. It was during the coordinated bombardments that one of the abducted Chibok girls, Solomi Pogu on a serial list of 86, was rescued by troops in Pulka village on the fringes of Sambisa Forest, Borno state. Gen. Nicholas while briefing journalists on the four-day military operations in the Lake Chad Region and Sambisa Forest at Maimalari Cantonment, Maiduguri also disclosed that during the operations, troops also recovered arms and ammunitions, including Armoured Personnel Carriers (APCs); and several terrorists were also killed from their Lake Chad Island hideouts. He said, “The operation is going on there in the Lake Chad Region. As at this morning (Thursday) some of the Islands have been captured from the Boko Haram insurgents. Some of their fighting equipment was also recovered. “However; over 2,000 people including women and children have been rescued and including some of the Boko Haram suspects, which comprise over 200 of them surrendered to our own troops in that northern fringes of Borno state. On rescued Chibok girl, he said: “We have also been in Sambisa general area; with operations, and as a result; one of the abducted girls (Solomi Pogu) was rescued along with another girl, Jamila Adams (14) who has a baby. He urged the people to support the troops with credible information on the movement of insurgents across the theatre assuring that the army that troops is doing their best to salvage the situation. The post Onslaught on Lake Chad Hideouts: Boko Haram factional leader, Nur, injured in troops bombardment appeared first on Vanguard News.